During a recent visit of Environment Minister of China, Jining Chen, to Heibei Province, Hebei Chengxin has been fully affirmed by the minister on our devotion to environmental protection and our commitment to corport social responsibility. Minister Chen further pointed out that our environmental protection principle and practice should be widely promoted among other businesses. Governor Qingwei Zhang of Hebei Province also highly praised our dedication to environmental protection. 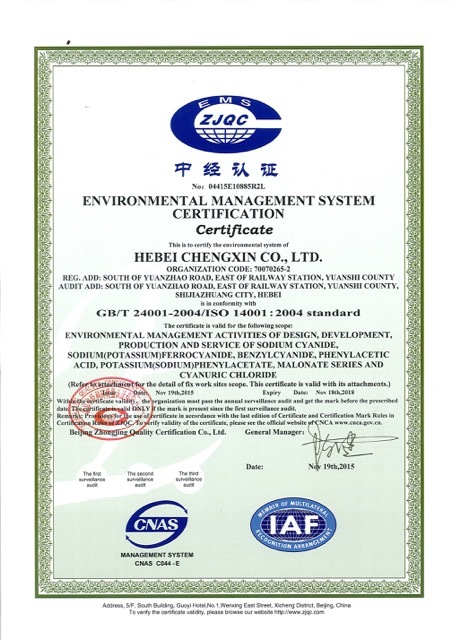 He further encouraged Hebei Chengxin to remain an exemplar in the industry, and continuously promote the best practice of its environment protection work. Recognition and affirmation from the Minister and Governor has been an incredible encouragement for us to achieve even higher standards. Hebei Chengxin will keep environmental agenda as our top priority, not to only focus environment work around our production and emission, but to extend such responsibility to surrounding local areas. We are determined to champion the national policy of securing lands around our factories and turn them into landscape and green infrastructure. Our goal remains to build “garden factories”, immersing factories into local landscapes. within the certificate validity, the organization must pass the annual surveillance audit and get the mark before the prescribed date. The certificate is valid ONLY if the mark is present since the first surveillance audit.